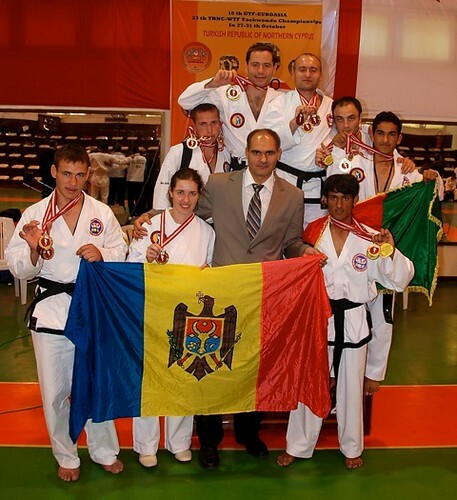 Participants from nine countries met at the Euro-Asian Taekwon-do Championship held on the island of Cyprus from 29 to 30 October 2010. We also went with a team of six athletes, five of which are instructors in “Stolas Leukas” club (Alexei Tentiuc, Gennady Bitco, Sofianu Marika, Tudor Rotaru and Aprodu Sandu) and Gennady Curbet, the president of “Dunamis” Club. Fighters have competed in hyeong (formal complexes), matsochi (wrestling) and kiok-pa (breaking boards). With God’s help this team of six athletes have managed to win 18 medals including 6 of gold, 8 of silver and 4 of bronze. In the overall ranking the team took the second place and was decorated with a beautiful cup. Once we arrived at the competition we had a pleasant surprise to meet another team of 11 Moldovan athletes, that are part of the club “Voievod” and who came to the championship with their instructor and chairman Nicholae Pascaru. We were glad to see their success and to encourage each others during the competition. Thanks to everyone who prayed for us and helped us to participate in this great competition where we could make friends with the trainers and athletes from participating countries and to tell them about us, about our country and especially about our faith in Our Lord Jesus Christ.